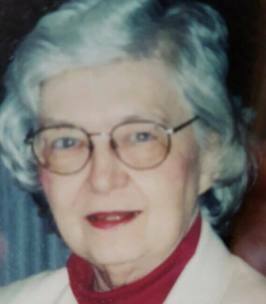 Marilyn R. Church of Mentor, passed away peacefully Oct. 17, 2018, with her family by her side. A long-time resident of Mentor, Marilyn was born April 18, 1924, in Marion. Her days were spent playing outdoors at the family farm and acting out dramatic plays with her friends. She graduated from Ohio University during World War II, and promptly got a job as a traveling sample girl for Proctor & Gamble. From there, she became a social worker and then finally an elementary school teacher, until her retirement in the late 1980s. Marilyn was active as a volunteer for many local libraries, a supporter of PBS and NPR, and a fervent supporter of and volunteer for the Lake County Historical Society. She treasured the friendships that she made throughout her 94 years. Marilyn is survived by her sons, John K. (Judith) Church, Jr. and Michael E. Church; grandchildren, Molly Church, Jessica (Brian) Bealler and Ian Church; and two great-grandsons, Aidan and Dylan. She was preceded in death by her husband, John K. Church, Sr. The family wishes to thank the staff at Salida Woods Assisted Living and Great Lakes Caring Hospice for their excellent care and service. Per Marilyn's wishes, there will be no visitation or services. In lieu of flowers, the family asks that you donate to the Lake County Historical Society or Great Lakes Caring. To leave condolences for the family or light a memorial candle, visit www.MCVfuneralhomes.com. To send flowers to the family of Marilyn R Church, please visit our Heartfelt Sympathies Store. I'm so sorry for your loss. Mrs. Church was a wonderful teacher and friend. I was fortunate that we kept in touch for many years. She always made me feel so special, and I think that was her true gift. There will never be another like her. She was my mon’s best friend and work buddy for decades at Browning Elementary. To me she was always “Mrs. Church” a family friend that took me though the 70’s, 80’s and 90’s. She was always happy and glowing, even when being around Jack C and my dad. I remember the first day she drove the Corvette to our home in Willoughby Hills. Or in 1976 at our farm in PA It’s been many years since we had seen each other as when my mom died, we lost the glue that held us together. She was a truly great person. She made a mark on my life, my wife and daughter’s The world is just a little bit dimmer with her passing. My sincerest condolences to the beloved family. During this painful time please turn to god in prayer. In the Bible ,god is described as the god of all comfort. (2 Corinthians 1:3,4) Surely he will abundantly provide you with this comfort during this tough process.